Lots of boxes with this one, but it was worth it. The extra storage allowed us to get rid of a small dresser and open up our space. The headboard is tall and adds a nice design element to our new room. I like that we were able to give up the bix spring, too. Its a perfect height without it. We love it! Upgrade your bedroom with this stylish contemporary storage platform bed. 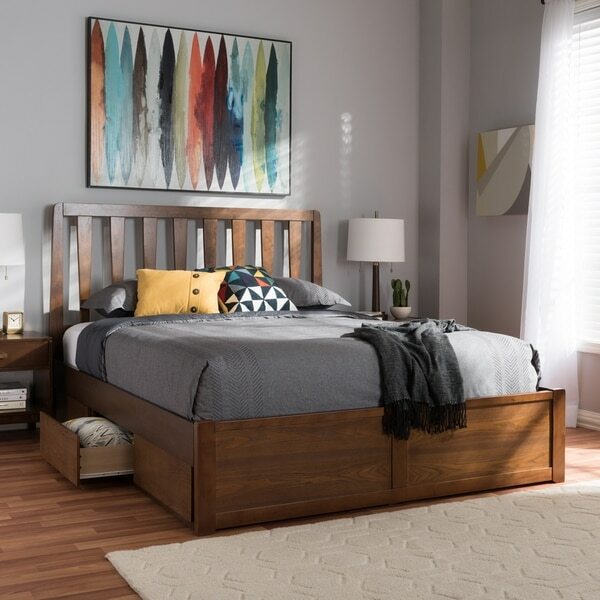 Built with a sturdy wooden frame and a warm walnut-brown finish, this bed's headboard has a unique open, vertical slat design. Six drawers under the bed provide for plenty of convenient bedside storage. Love my new bed. It is very solid and well built. I love, love, love the headboard and the storage underneath is a big added bonus. This bed looks absolutely beautiful and the storage drawers are great. But I'm taking away a star because 1) it came missing a bunch of assembly parts. Overstock sent new ones no issue, but it took 2 weeks and we got frustrated not having a bed and ended up going out and buying what we needed ourselves. 2) our king mattress doesn't quite fit - the frame it too wide so you can see the slats on the sides. With a big comforter draped over we can hide it at least. I'm very happy with the bed. I put it together myself, not long after a hip replacement, so it is EASY, but definitely time consuming. The quality of the woods and finish are quite nice, and the drawers work well. It is very sturdy as well. I am 6'4" and 300 lbs. The only thing I would change is to make the base about 6" higher. This bed was exactly what we were looking for. Our mattress has never been more comfortable than on this platform bed! It took about 3 hours of assembly (including some mistakes) and is very solid so far! Easy to understand instructions and looks great once assembled. Sturdy built with many slats for very strong finished product. Plenty of storage with six drawers below. Purchased this bed for my sons room to save space. It went together easily according to my husband and is a solid piece. Love the color and design, and it has 6 drawers that provide plenty of space for all his clothes and storage needs. Price for this piece is more than fair. We received our bed which was very well packed. The assembly was not difficult and the instructions were very good and easy to follow. The assembly took about 3 hours to complete. I would recommend this bed for anyone who wants an extra storage bed. It can be used with or without boxsprings. its very nice. This bed was exactly what we were looking for. Our bedroom is pretty small so we needed the extra storage space. The color and quality is gorgeous and putting it together was not as bad as we anticipated. Very sturdy. Highly recommend!! So far so good. Keep in mind it comes in a LOT of boxes, 6 boxes, and most of them are BIG and 70lb each. This is not a cheap Ikea bed weighing 150lb max, it's solid. Love it so far. Will see how it holds up, it could be an issue getting delivered to an apt or somewhere you are alone if not very strong! Missing all hardware and instructions. Seems to be of good quality, but the process has been a nightmare getting what we need to build the thing. Boxes delivered in fine condition, but prepared for A LOT of packaging to dispose of. Good for protection in delivery, bad for the earth. Will update this review once it’s actually built. My headboard had a big chip in it, but it was such a hassle to put together and get it here in the middle of winter, we made it work. I do love it and I'm happy with my purchase. I just wish it didn't have that on it - I hate paying so much money out not to have it in perfect condition. The bed frame is beautiful and feels very sturdy. No creaky sounds or wobbles. It was not that difficult to put together. Two people were able to do it in a few hours. I love the extra storage. Feels like a great value. Based on prior reviews this item looked like a great deal and I need a new storage bed for the guest bedroom ASAP! "How high off the floor does the mattress end up sitting?" "Are there matching dressers and night stands for this bed"
There are several mid century walnut night stands that would look nice with this bed. The one pictured is https://www.overstock.com/Home-Garden/Porch-Den-Anderson-Contemporary-Brown-1-drawer-Nightstand/21895388/product.html?refccid=ERB4VYCSPOUKPBCMCGGT2TQLAY&searchidx=57 This set would look nice and has matching nightstands and high boy: https://www.overstock.com/Home-Garden/Adler-Natural-Walnut-6-Drawer-Dresser/14491442/product.html Whatever you choose, it is nice to have pieces that are not exactly the same or else it may look too matchy-matchy. Mix it up and add a little character to the room. There are even walnut and white dressers. "Can you use the frame/bottom part without the head board? Can you put a different head board on this frame?" There are two pieces, upper and lower, that attach to the side rails and provide some stability without the use of a headboard. The headboard attaches to another piece which is about 25" tall and is connected to the side rails. There is a 6" notch where the headboard is attached, so the headboard begins at the 19" mark and screwed into the notched part. The headboard is 64 1/4 inches wide. "What is the measurement from floor (bottom of drawers) to top of side rail?" From the floor to the top of the side rail is 15", same as the footboard. From the top of the slats to the top of the side rails is 2 1/2". "Do you need a box Spring with this bed frame?" A box spring is not required. It is designed for use with one mattress. "Is the bed made for just a mattress or will it work with box spring & mattress?"